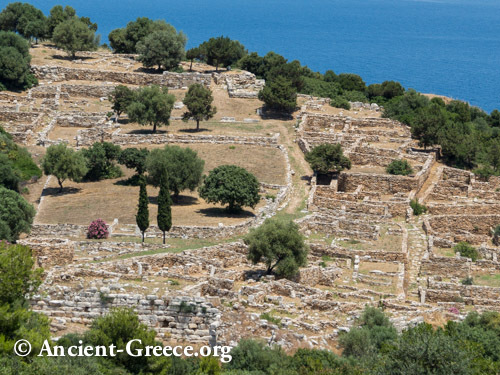 Rhamnous (Greek: Ραμνούς; Also: Ramnous or Rhamnus or Rhamnounda) is and ancient Greek fortified town, located on the Attica coast, about 55 kilometers northeast from Athens. 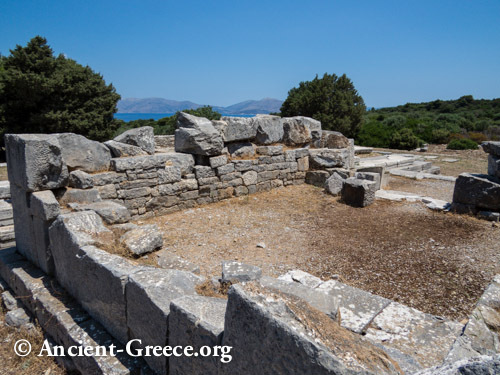 It was named for the local prickly bush called ramnos and was the most important sanctuary of Nemesis in ancient Greece. 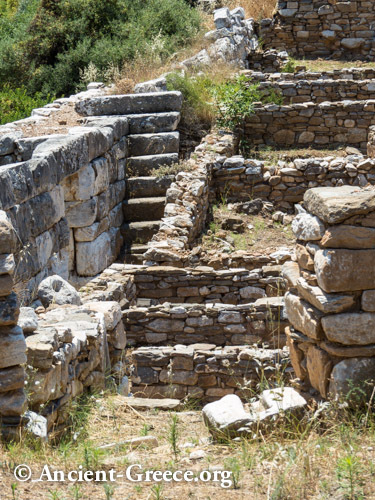 The temple of Nemesis in Rhamnous was renown even before the fortified settlement acquired importance in the 5th c. BCE. Nemesis was the goddess that prescribed happiness and misery to mortals, and a zealous punisher of "hubris" (ύβρις) - the disrespectful arrogance of humans who thought their destiny was under their own control. 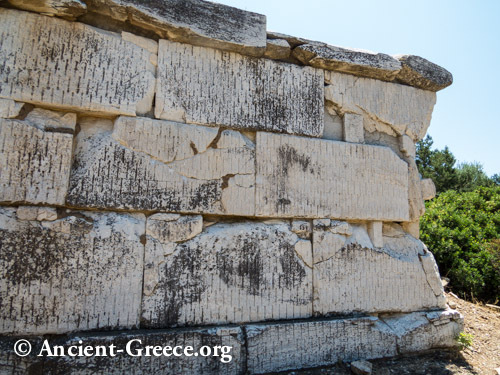 The worship of Nemesis ended in 382 CE when the Byzantine emperor Arcadius ordered that all pagan temples be destroyed. 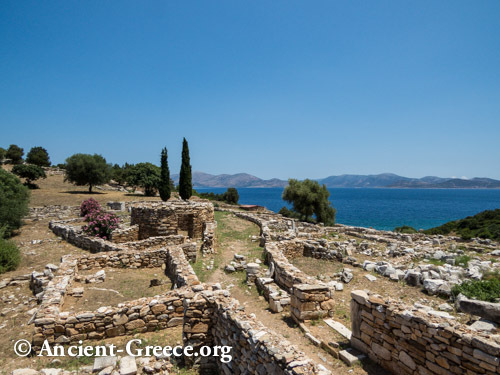 The fortified settlement of Rhamnous was of strategic importance to Athens in the Archaic and Classical eras because it guarded over Euripos and two small harbors that provided shelter off the east coast of Attica to southbound ships. 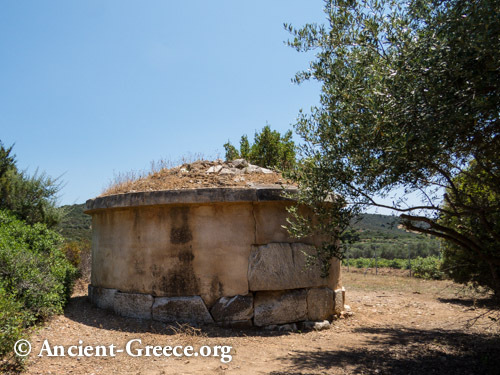 During the Peloponnesian war, and after the Spartans occupied the fort of Dekelia, Rhamnous provided safe passage for Athenian food supplies that came from Euboea. 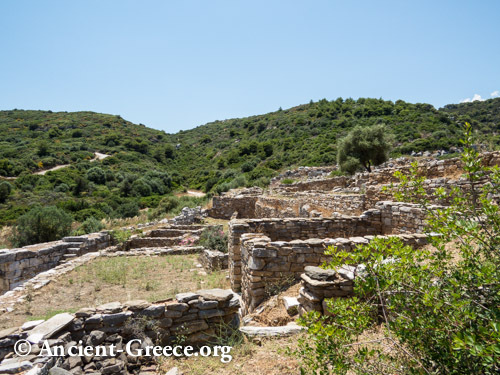 Rhamnous was the birthplace of Antiphon (b. 480 BCE) who founded a school attended by Thucydides. 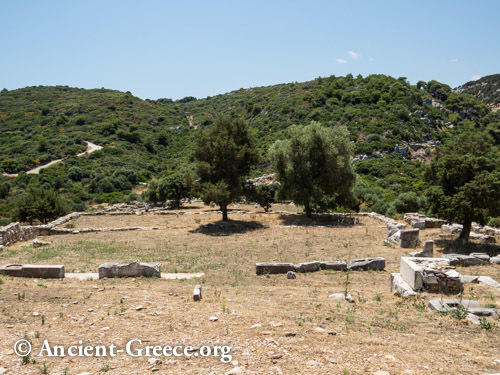 The mid-5th c. BCE temple of Nemesis (on the left) and the smaller early 5th c. BCE temple on the right (probably dedicated to Themis) is visible in close proximity on the right. A colossal statue of Nemesis, carved in Parian marble by Agorakritos, resided in the temple, the head of which is now in the British Museum. 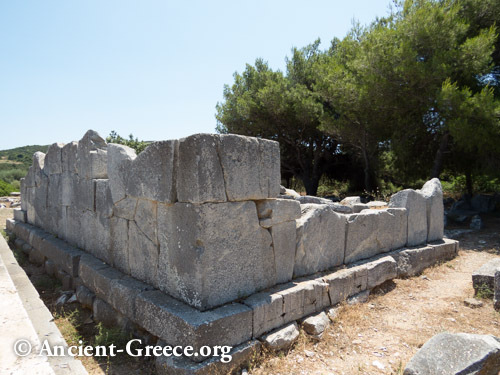 The early 5th c. BCE remains of the smaller temple next to the temple of Nemesis. 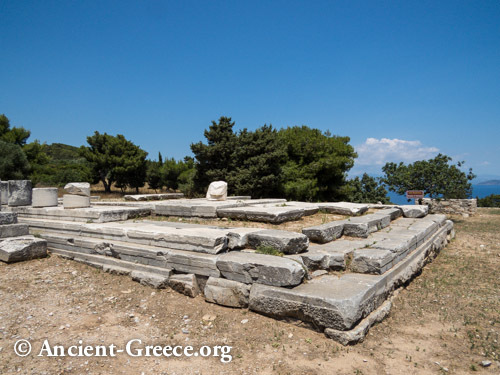 It is believed that it was dedicated to Themis or to Themis and Nemesis jointly, and it was built with polygonal marble construction. 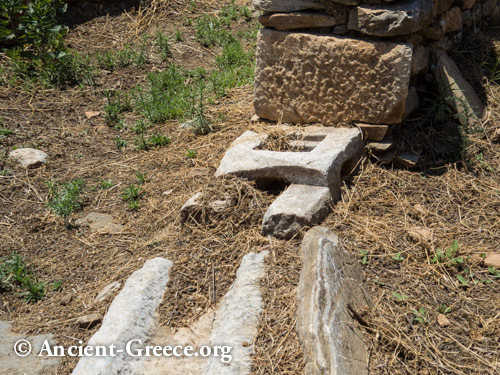 It measures 10 x 6 meters and was abandoned in the 4th c. CE. 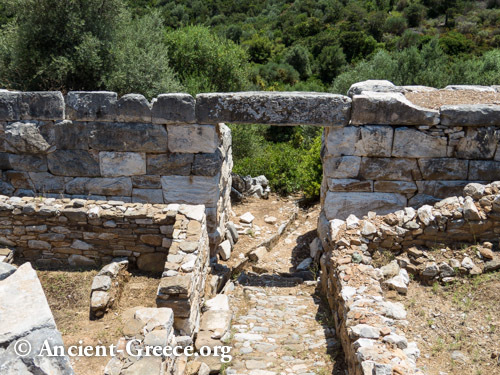 It was built on the site there was an earlier temple of Nemesis from early 6th c. BCE is known from a few Laconian roof tile remains, and another made of poros stone that was probably destroyed by the Persians in 480-479 BCE. 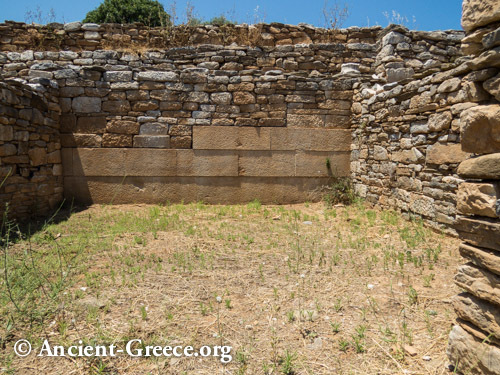 Although very few fragments remain from the temple's columns, it was a peripteral Doric temple (6 x 12 columns) made of local poros stone. 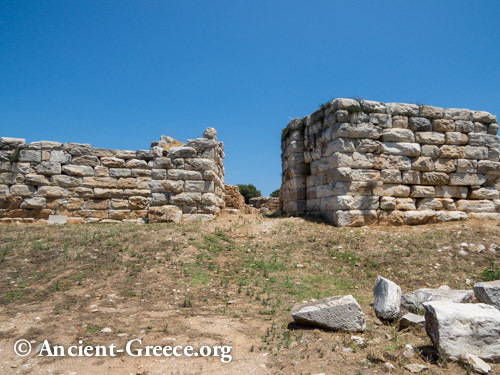 Two views of the remains from the temple of Nemesis, the Nemeseion, which was built sometime in themid- 5h c. BCE. 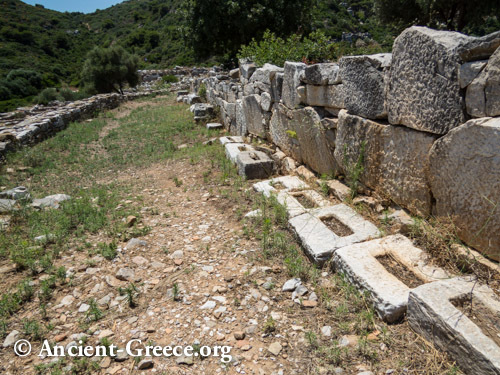 Other archaeological finds in the area denote worship of Nemesis as early as the 6th c. BCE. It exhibits the typical divisions of a cella, pronaos, and an opisthodromos in antis. 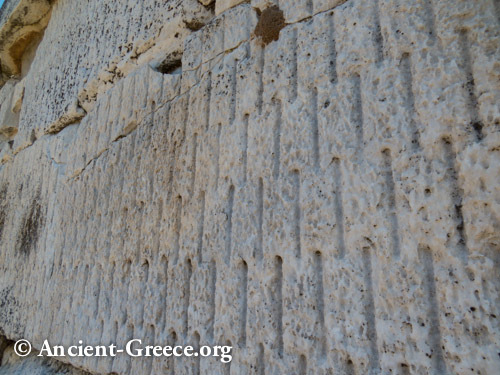 Visible in these photos are the column fragments with the incomplete flutes (only visible at the bottom), which mean that the temple was probably left incomplete. 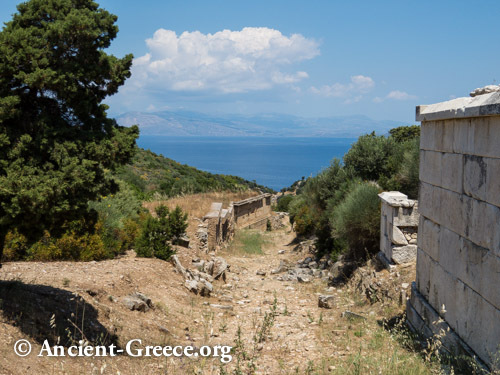 The path from the temple of Nemesis (left) to the fortified settlement of Rhamnous is a rough one (about 10 min.) but the views of the ancient town (right) provide ample reward for the hike. The stone fortifications with the southern gate flanked by square towers (left). Street in the interior of the acropolis. Many house foundations make up the archaeological site. 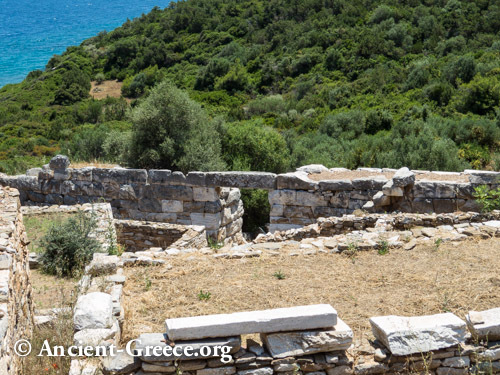 The fortified settlement hosted an Athenian military garrison and protected the two harbors below that served as the base for ships that patrolled the passage between Euboea and Attica. 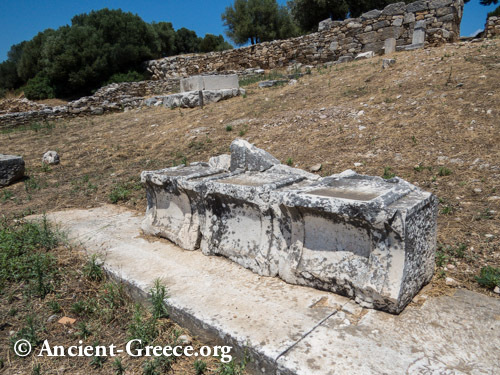 Three marble seats (left) have survived of the barely discernible theatre of Ramnous (view on the right). House walls have been preserved and reconstructed to a considerable height. One of the wall gates on the south end of Rhamnous. 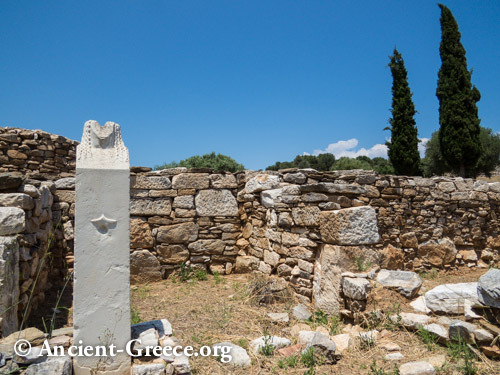 Various ruins and details are scattered throughout the town: a sophisticated marble water spout, part of a column, and a replica of a damaged Herm. 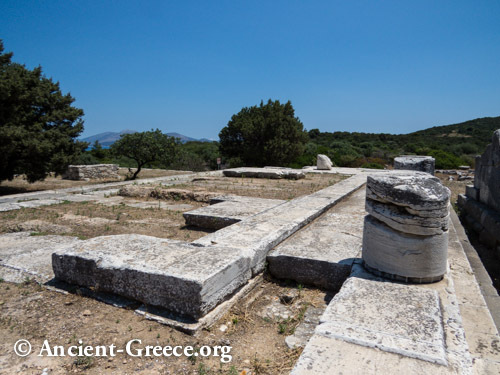 A road from the fortified acropolis, passed through the sanctuary of Nemesis and led to the deme of Rhamnous which belonged to the Aiantis tribe. A plethora of funerary naiskoi, stelai, and grave monuments flanked the road. 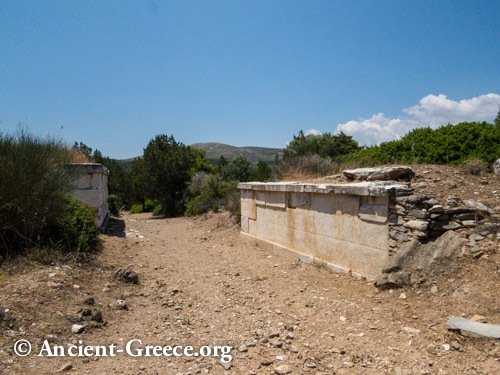 A family tomb from the 4th c. BCE is found along the aforementioned road.